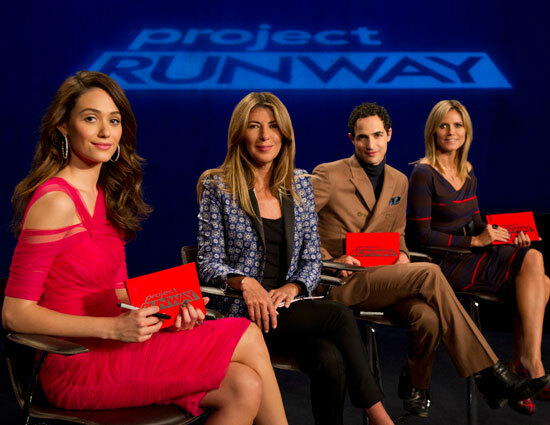 Every Thursday my mom and I sit down for our ritual viewing of Project Runway. This show leads to a a lot of frantic internet searching for similar items to those displayed on the show, and one of the items that I’ve been coveting this season is a quality pattern-print blazer. Nina Garcia wore it in the Thunder Down Under episode, and you know it must be love-at-first-sight if I’m paying more attention to her blazer than super-buff guys. Blazers are probably the hardest thing for me to buy because I’m a 24/26 top but with fuller arms, so I tend to not fit into blazers for stores who only sell sizes up to 22/24 (I’m looking at you ASOS). I had to pass on a lot of blazers, but decided to throw caution to the wind and get a blazer that might not fit from Eloquii. Eloquii is closing soon :(, but because of that they are having really good sales, so that helped a little bit in trying out risky sizing. Lucky for me, the risk was worth it. 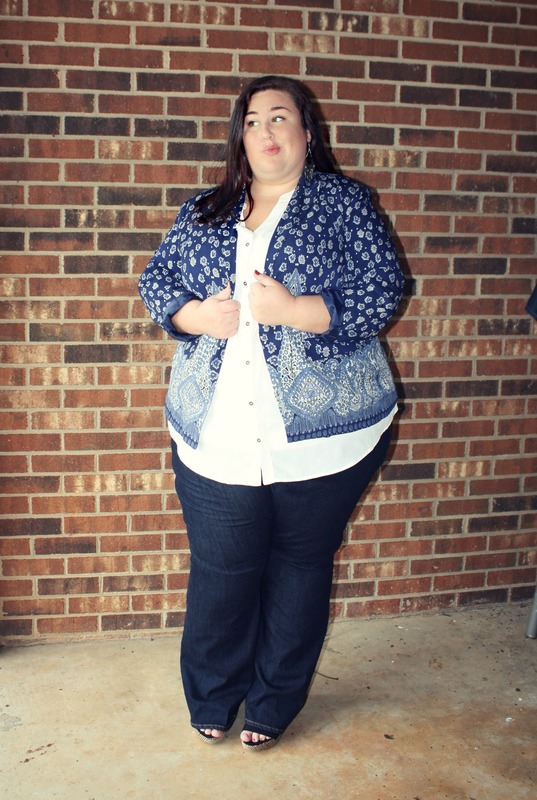 This is Eloquii’s Navy Status Blazer, which has a floral and paisley-ish pattern. I could use an extra inch or so just about everywhere, but it is survivable ;). What I love about it, though, is its light weight material and causal vibe. Wearing it with a flowy blouse and dark jeans gives me a polished but casual look that will see me through teaching or going out with friends. One of those awkward gems you just have to share. Are you into patterned blazers? What types of prints/patterns do you look for (stripes, polka dots, florals, etc)? You have to go to http://www.cjbanks.com. They have very well made–quality materials–clothes. Affordable, especially their clearance sales. They have a wide selection of blazers in your size range and there clothes are generously cut; I shop there frequently. Here’s a great geometric blazer! Not quite like Nina’s, but it’s a good start. Great patterned blazer. I love blazers! I want the Lauren plus size pink, white and navy blazers. All over $100. But I want anyway because you can put them with outfits you put together. Yeah if they are a good color and fit, they can really become very versatile and worth the money! Great blazer! I have a similar problem but mine is in the bust- even button down shirts are a pain. Hey Rebecca!! You look awesome as always! I want to order the wedges that you have on but I have never ordered from New Look. I am clueless as to what the U.S. equivalent would be for their prices. I hope I am making sense. I am always hesitant to order from sites that don’t list in U.S. dollars! Junetta, I usually put the items in my cart and then do a price conversion to understand what price I’ll be paying. I usually google “36 uk lbs to us dollars” and it will tell me, or I use this site: http://www.dollars2pounds.com/ Make sure to also convert your shoe size! 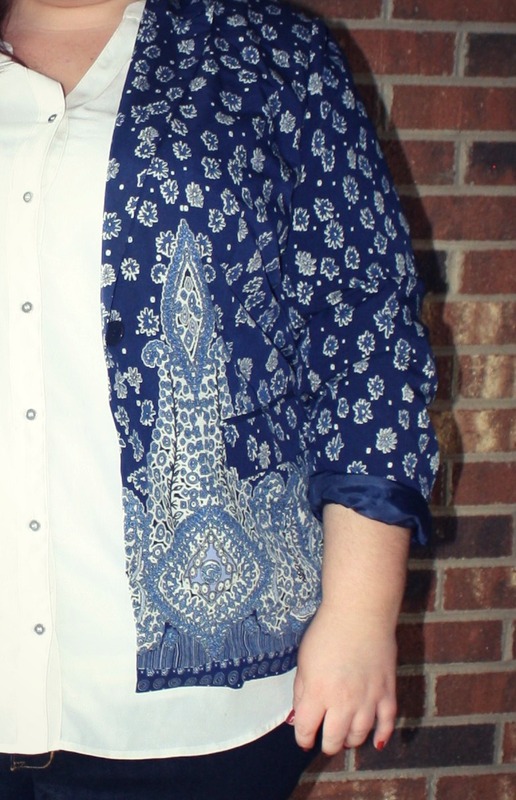 It was just this spring that got to try out floral printed blazers since its the season’s trend. Although before i stay safe with plain black and gray colored blazers. Nice print, i hope i can find same thing here. I am all for that blazer! I think it makes a pretty good dupe for Nina’s. But I totally understand wanting to find the EXACT look. I spent about 2 years trying to find a pair of owl pajamas that Oprah wore one time. It was totally worth it! You look fabulous in this. Those jeans look perfect. I know they weren’t the point of this post, but do you like them? Yes! I definitely like them. They run a little large and are stretchy. I’d size down if I were to buy another pair. Love the concept of a printed blazer and must say the colour palate with your option is appetisizing as it is not too much but perfect for casual or dressed up. You look chic and elegant. What material is that blazer if I may ask? I also struggle as I have big arms.